After the success of both Alan Weisman’s 2007 novel The World Without Us – an investigative and imaginative exploration of what would happen if humans suddenly disappeared from the face of the Earth – and the subsequent 2008 feature-length History Channel documentary Life After People, it’s no surprise that the History Channel spun the underlying theme into this episodic series. Expanding on the broad overview that was taken in both Weisman’s book and the original documentary, this series seeks to fully investigate numerous specific topics associated with a world without human beings. Whether or not a second season is in the works, this dvd collection has been labeled “The Complete Season One” and includes 10 episodes that aired on The History Channel beginning in April of this year. Each episode is 45 minutes long and typically follows a standard time table of predictions ranging from mere hours to thousands of years, theoretically answering questions such as how long before oil refineries and breweries explode to how long before national landmarks collapse. Featuring extensive interviews with various industry professionals (architects, scientists, historians, etc.) and impressive cgi representations of the destruction of human artifacts and the regrowth of the natural world, the series is both informative and visually stimulating. The episodes range in topic from the effects of flooding waters (in the tumultuous episode “Waters of Death”) to the structural longevity of the various steel and concrete structures of America (in the cgi-heavy episode “Heavy Metal”). Though the episodes in this series tie together collectively to form a cohesive story, each individual episode stands on its own as a thoroughly fleshed out examination of a topic. As each episode unfolds, the respective topic being covered does get thoroughly explored even though occasionally the episodes do go off topic with their investigations of abandoned locations throughout the world: though interesting, what does a segment on Hashima Island have to do with the topic “The Bodies Left Behind?” These forays into the past and present situations of various abandoned areas are all fascinating and most likely intended to liven up each episode with real-life footage rather than relying entirely on cgi and conjecture, they just sometimes feel like part of a different storyline. But if you’ve ever wondered whether the Willis Tower (previously Sears Tower) would outlast the Hancock Center in a world without human upkeep (episode “Outbreak”) or wanted information on the Voyager space probe, this series is for you. 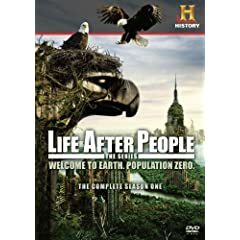 No user commented in " DVD Review: Life After People: The Series – The Complete Season One "